The last day of May saw much activity on many fronts. The DST concentrated on Henry Ellison including drilling and tapping patch screw holes on the foundation ring, fitting washout plugs and cleaning and painting sundry items. The PWT had a slightly delayed start waiting for some essential shunting before setting out for a day's joyful fishplate greasing that completed the Shottle to Hazelwood section and achieved 16 pairs south of Hazelwood. Whilst waiting for the train at Wirksworth hand weeding took place of the track alongside Platform 1 that had missed the spraying as stock had lived there for several weeks. VCT worked in the area of milepost 1351/4 with a reduced crew of three but managed to open up another vista and had one satisfactory fire to burn the brash. The LMSCA constructed the first two of 14 tables to be fitted to the Third Open. The electrics at Duffield received some attention and there was confirmation that Wirksworth's invasion of Siberian Long Tailed Hamsters have been repulsed. Dawn Swepstone accepted the daunting challenge of refiling the contents of my office and much progress has been made to very good effect. The Talking Tunnel has been returned to life and the Booking Hall continued revenue accounting and generation. We said a temporary goodbye to D8001 which has left us for a commercial renovation in Birmingham. It will be in fine form on return after a few months away. PS - A conversion programme has been agreed for diesel drivers who wish to learn how to drive steam on the Incline. This programme will be managed by Bob Gibbens. Please let him know if you wish to participate. Plans are advancing to finally bottom problems on the long welded section which will occupy weekdays over two weeks commencing Monday 11th July. A third week will be held in reserve if we meet the unexpected. A call will be made for all hands to the pump over this period, whatever your skills are, as lack of manpower will impact on our ability to continue to operate the whole line. Remember that brute strength is not needed to supply the team with regular supplies of tea and coffee! The third day of our Bank Holiday weekend hosted unremitting rain and it was a wonder anyone turned out to visit us. Nonetheless, a respectable performance was achieved and a technical hitch with the 3 Car set was seamlessly dealt with by a replacement 2 car which was more than able to cope with passenger demand. The alternating steam and diesel on the Incline worked well and all our visitors seemed pleased although damp. Catering, the Booking Hall, Duffield, narrow gauge and EVRA shop all put a brave face on the prevailing conditions. The total take over the holiday was three times greater than for the same weekend last year for around the same operating costs so we must be getting something right! My thanks go to all that participated in dismal conditions to make the weekend a success. It is not joyful to be third man on the Duffield service when it is pouring with rain - very well done. more presentable. The Clochemerle site was also de-weeded. Today was Day 1 of the Wirksworth Carnival bank holiday weekend, as well as the first operating day post-78019. In actual fact, the passenger numbers were pretty solid throughout the day and a very successful day was had. We also played host to our first Day with a Driver for quite a while too. Down the yard, a team entertained a Drive a Diesel guest who also had lunch in the Gatwick Express. The Class 31 received some maintenance and the LMSCA were in attendance having a creative moment making tables for the Third Open coach. The grass had a hair cut. A wild and windy day with a small PWT setting off for Hazelwood to collect palisade fencing for use at Gorsey Bank and the VCT trolley which needs a little maintenance work. During their journey they replaced cracked fishplates near Barnsley Lane found during yesterday's patrol, remedied a pair of fishplates that had been put on upside down and replaced four defective or unsuitable fishplate bolts. VCT settled in again between mileposts 1363/4 and 137 to clear more lineside debris that was consumed by two good fires. Before the PWT departed the large water tank wagon was shunted to be filled and returned to its resting place at the end of the day. A wagon of logs that is to be emptied this evening was returned to the Car Park. The Information Room floor is receiving attention and a portion is presently missing! 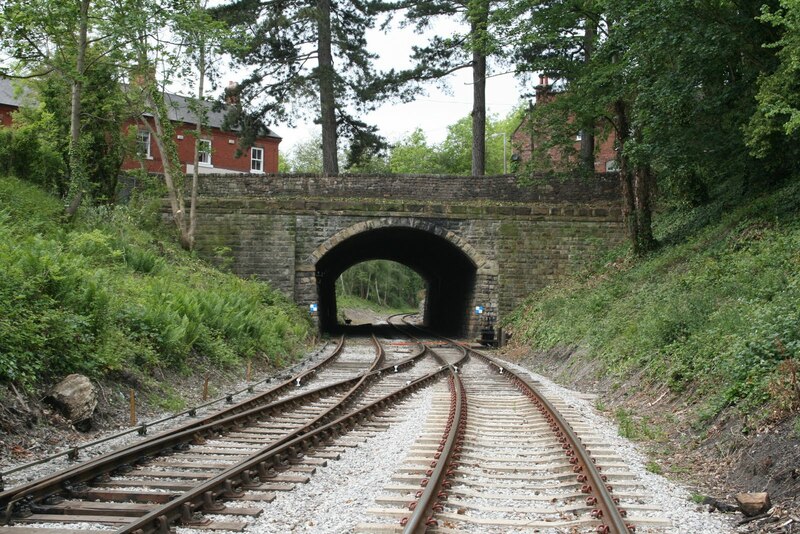 The Network Rail contractors finished their work on Duffield Tunnel and it is reported that its northern aspect is much improved and has been treated with "Roundup" to slow down regrowth. A red letter day for the LMSCA as the first tentative steps were taken with the Stanier BTO (formerly known as a BTK) in that stripping of varnish commenced on the removable seats which will be provided in the "disabled" area. Work also continued on the BR Mark 1 BSK. The Booking Hall continued its quest for new group business. David Brooks sent me a few photos of 78019 being loaded in the Car Park together with a remarkable view of the locomotive passing Wirksworth Market Place. This is attached for your delight. A day of quiet determination with vital tasks being undertaken. The PWT divided into teams to conduct a full line track patrol and fishplate greasing north of the Cromford Road bridge on the Ravenstor line. A most vital commitment and very valuable in ensuring the safe passage of our trains. Following its period as the supplier of coal to 78019 the Komatsu was released to return to flailing and the area from the base of the Incline to the Cromford Road bridge had three passes to good effect. The lone carriage cleaner gave a final touch to the "steam" stock for the time being and dealt with the aftermath of the weekends parties in the Gatwick Express so that we start the coming weekend in good order. 78019 departed, in two parts, at 1135 for the Great Central Railway with quite an audience in attendance and the cooperation of Severn Trent Water who had many activities in Coldwell Street that could have frustrated the movements. Network Rail's contractors are making a very good job of relieving Duffield Tunnel of its accumulated ivy and other vegetation. I attach a photo of the south end portal that now looks very tidy. 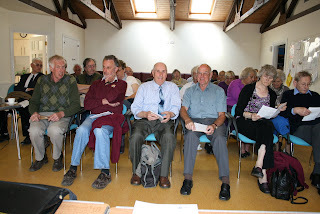 Another visitor to Duffield was the Ordnance Survey to ensure the loop appears on future large scale maps. The Booking Hall maintained the pace of future group bookings with 2012 now featuring. Delivery of the Wirksworth Community Fayre newspaper arrives and who should be on the front cover? Hylton Holt features yet again and I imagine he will be passing round signed photographs before much longer - TV, quality magazines and newpapers! A two part commentary today! Many activities on site today including preparing for the departure of 78019. The Multicar had its tank topped up with weed treatment in readiness for its next outing. The Komatsu and Dumper shipped coal from the former Dust Dock to No 3's coaling area and the "steam" coaching stock was berthed at Platform 1. LJB shunted the log wagons back into the Car Park and prepared the Works Train for its rail gathering exercise following which 15 rails were loaded from the Gorsey Bank line to the Sturgeon. During the lunch break 78019 was shunted to the Car Park, entailing further movement of the log wagons, and the loco was "split" ready for transport tomorrow. The Works Train and Komatsu then left to deposit the rails at various locations between Gorsey Bank and Idridgehay to exchange for rails that have corrosion problems. The VCT returned to a site north of Shottle to open up a further 50 yards of viewing on the Down side with the associated two large fires. The LMSCA continued table manufacture for the Third Open and the grass was cut in the picnic area. The DST reamed the foundation ring holes from Henry Ellison ready to receive rivets. No 3 was cleaned for the Bank Holiday weekend. The vegetation on top of Duffield Tunnel had the benefit of the first of three days attention by Network Rail contractors and two one metre sections of rail were cut at Wirksworth for use by Birmingham University. As 78019 is prepared for departure it is opportune to comment on the 21 days it operated on our Railway through from the preparations and trials for the Royal Opening through to last weekend. The support of the Great Central Railway and the owning group has been without parallel as they good humouredly dealt with our first tentative steps to manage a steam locomotive over the whole of our Railway and it has to be remembered that they facilitated the loan of the Royal Saloon as well. Pressure on us to deliver high levels of staff in all areas to support the opening, two four day bank holidays and the final weekend with its two evening charters has been immense and quite exhausting. The rewards have been significant and the Railway in its full form has been well and truly launched. My sincere thanks go out to all who participated in a practical way and I am well aware that many went "above and beyond". Our final weekend was spectacularly enhanced by the energy put into it by the Bachmann Collectors Club and I pay tribute to JHT who steered this through its long gestation period making Saturday the highest earning day we have ever experienced. We have learnt a lot from this intense period of effort which will steer future planning for visiting locomotives and their attendant calls on resources. Meanwhile, it's heads down again as we get down to marketing and operating the remainder of this season to build a base of finance that will enable investment in a battery of desirable onward projects. that we hope to have it visit us again. people, and we have various lessons to digest, as would always be the case. got the 2011 season off to a cracking start. Thank you all. A fantastic start to the final weekend of running with 78019. Today we hosted the Bachmann Collectors Club for an event called Bachmann Trackside 2011 which involves stalls, stands, tours and walks hosted by them, whilst we provided steam and railcar trips on the Duffield line and Iris and No.3 trips on the incline. It was lucky that the railcar had been strengthened to 5 cars as the load more than happily outweighed the capacity of a 3 car set on both railcar journeys. 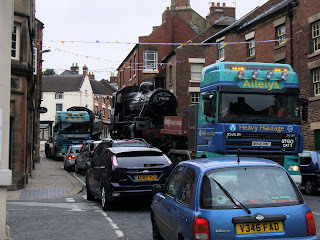 Both steam runs on the Duffield line were also full. The Narrow Gauge and Miniature Gauge were also in operation. Many thanks to all were involved in putting on an excellent event today, the weather was good to us! Quite a manic day with a Group Drive a Diesel Day intertwined with a customer and the necessity of getting into top gear for the weekend. Our Group Drive a Diesel guests were somewhat frustrated by L J Breeze failing to start but after a battery charge the machine burst into life. Meanwhile the Class 20 was fired up and the team continued their day ably hosted by Richard and Vince. Our customer returned after many months of absence reporting a much improved order book and were guided by Mick Thomas reporting a successful day with a visiting Network Rail assessor. The dmu team fettled and fuelled their fleet, preparing our first five car formation to be used tomorrow in high anticipation that we will feel the splendid strain of very high levels of business. Saturday will see our first Backmann day with a great deal of pre publicity and they have used the day to set up their "mission control" within the training room and gazebos outside the building. The Booking Hall and Catering were in warp drive to ready themselves for the weekend ahead. This being the last opportunity to ride behind 78109 before it returns to its home. A special vote of thanks to JHT who is talking to the Burton Model Railway Club tonight in advance of his testing time orchestrating the Bachmann event tomorrow. A varied and satisfying day with the PWT dividing into two parts, the first greased some 18 pairs of fishplates on the Incline and the second recovered fishplates and bolts released from the rail to be recovered from the Gorsey Bank line. The VCT continued their clearance efforts north of Shottle and two good fires were reported. Alan prepared and undercoated mileposts 137 and 1371/4. The Multicar set sail again to weed treat the line from Wirksworth to Idridgehay concentrating on areas of more dense growth. Further treatment of parts of the Yard was also included in their day. There was preparation for a customer visit tomorrow entailing the movement of sundry items north of the Cemetery Lane bridge to release 3 trolleys required for the test. Coal was moved from the Dust Dock area to the storage area for No3 and the team of engineering boffins successfully started Faraday after a great deal of preparatory work. A plume of diesel fumes went skywards to signal its return to life after some 4 or 5 years. Preparations for the weekend continued and toilets filled on the "steam" stock. Inclement weather during the morning frustrated the planned weed treatment run and continued fishplate greasing. However, the PWT occupied themselves with the collection of two wagon loads of logs for customers in Wirksworth and cleansed the lineside of these potential hazards from Duffield through to near milepost 134. The team also gathered life expired sleepers from Shottle and added them to the heap south of Hazelwood where they can gently degrade. Leigh entertained an unexpected photography group from Derby U3A who showed their appreciation with a small donation to the funds. The Head of Gardening was in action on the Wirksworth Station garden and our lone carriage cleaner dealt with the "steam" stock together with some carpet cleaning in the Gatwick Express. I was able to "top and tail" the excellent work produced by Bob Gibbens for the operation and maintenance of steam engines which will form appendix documents to our Safety Management System. These documents will be available on the member section of the web site in the near future. A test customer booked for Friday checked over their equipment that has been resting with us for some time without use. They reported that their order book is showing signs of life again which will also be good for us. A large contingent were on site today tackling a diverse number of tasks. The VCT fielded a team of six who attacked 80 yards of growth on the down (west) side north of Shottle feeding 3 fires and opening up more views. The DST supervised the turning of Henry Ellison's boiler by a contractor and cleaned out No3 after its weekend exertions. Brian Ashley and Matt readied the miniature railway for service on Saturday. The Incline received some further vegetation clearance and the ministrations of the PWT to some dropped joints. The PWT had earlier released some 15 rails from the Gorsey Bank line for use in the "main" line to replace corroded rail. It is likely that the Gorsey Bank line will be permanently shortened as we seek to get the Duffield line up to standard without spending a fortune on replacement rail. Yesterday, David and Dorothy placed six hanging baskets on the Duffield lamp standards adding colour to six small planters previously placed there. Longer chains were fitted to the platform seats so that they are not directly under the baskets. Some distortion of the newly laid tarmac has occurred due to what has turned out to be "mares tail" trying to push through. After taking advice a strong dose of weedkiller has been applied in the hope we can prevent further damage. Steady progress was made with the Faraday restoration to life project. The LMSCA continued with their tabling of the Third Open project. The Booking Hall got their accounts up to date after the successful weekend and a gentleman came to tend to our Siberian Long Tailed Hamsters and arrange their despatch to a better place. A slightly damp and cold day but this didn't keep the public away and we were happily busy for most of the afternoon. The conscripts were on vegitation control on North End path. Sunshine and showers today but it has to be said that today was much busier than anticipated, maybe a 100% increase on even last week at a guestimate. This left every service full. It is very difficult to tell how busy it is going to be at the moment as there is still a certain amount of newness to the Duffield service. Our featured person today was Robin who enjoyed a Drive a Diesel Day as a birthday present from all of us for his work with the web site and the rota system together with his physical work in various operating guises. Opportunity was taken during his day to test the Class 20 on a train to Duffield and back which proved this would be a sensible possibility when 78019 has returned to its base. We also were able to pre-test a scenario on the Gorsey Bank line that is part of an offer to a customer involving accelerating to 20 mph on a short length of line. A lone PWT member dealt with the tightening of nuts at Shottle North and the correction of mismatched track clips at both Shottle North and South. He also oiled the gates at Gorsey Bank so that their operation is somewhat easier. The dmu team undertook some maintenance and fuelled the fleet up for the weekend. The Booking Hall received visitors and prepared for the weekend. During the day it was noticed there were some very bold "Siberian Long Tailed Hamsters", with thanks to Anton for the identification, that had invaded our space to surprise visitors over the weekend. Their departure from site is promised on Monday. Meanwhile, all participants at the weekend are advised to be cautious around the Mess Hall area as there may be competition for their comestibles. Special thanks go to Chris, Patrick, Peter and Jeff who are looking after an evening charter and buffet meal tonight. Another most pleasant and productive day. Iris departed to collect the Rolls Royce Old Boys Club from Duffield, apparently a different group to those we have amongst us on a regular basis!, were ably hosted by Patrick, John and Alex. They had a full visit to everything at Wirksworth including a "behind the scenes" look at our visiting locomotive. The VCT coped well with this intrusion to their planned tasks and managed to clear a further 50 yards of blackthorn opposite the former erosion site opening up more views involving the creation of two large fires to consume the brash. Alan reported the repainting of numerous mileposts with his one man attack on the lineside furniture. Vince the Elder enhanced the VCT's efforts by tackling the sight lines on the Incline north of Cemetery Lane bridge. There was a survey of the S&T travelling van with a view to refelting the roof and repainting the vehicle which looks somewhat sad at the moment. There has also been a survey of "Faraday" to see whether it can be made a runner again with attention given to its injectors. Given its historic place in our development it would be good to see it operational again. The automatic watering system for the hanging baskets of Wirksworth has been modified and tested to include the planters around the Booking Hall and the Weighbridge mini workshop had a tidy up and removal of extraneous items. The LMSCA have been on tour to source hardwood for tables from Sheffield at some cost to the group. The Booking Hall benefited from today's group and continued to replenish our coffers. The day was dominated by matters permanent way with a further attack on the need to ensure all fishplates are greased, 12 pairs achieved, and a fortnightly all line track patrol. The Komatsu had some tlc and a wipe down of its paintwork. A lone carriage cleaner reported, exhaustedly, if it moves it has been cleaned! She rounded off her day by giving the fridge in the Mess Hall a good do. The Booking Hall continued the good work of teasing more revenue into the system. A most productive day with activities on many fronts. The VCT returned to the challenge of the "racing straight" creating a very large fire to deal with brash from that area and transported from Ken Rowland's crossing. Attention was also paid to overhanging vegetation at Idridgehay that was encroaching on the line to impact on our coaching stock. Alan continued his quest to improve the condition of our mile and gradient posts. The DST reported good progress with the foundation ring for Henry Ellison and that the dome, injectors and regulator had been cleaned up for refitting. The LMSCA have been finalising the design and quantities for the installation of tables in the third open together with initial manufacturing of the steam heater fittings. The PWT concentrated on the Incline with much fishplate greasing, the first such exercise since the line opened, and in the process found and replaced a cracked fishplate illustrating how valuable these "routine" tasks are. It is quite daunting that we have a very long railway to maintain now. The Duffield cabin received further attention to its paintwork and we were pleased to welcome a test customer ably looked after by Mick Thomas. I also welcomed Howard Johnson, a journalist and event organiser more publicly known for his editorship of Tramways & Urban Transit where some ideas were discussed for 2012. The Booking Hall brought their accountancy up to date after the weekend and processed a further encouraging number of charter enquiries. A very pleasant catch up day with all the background beaurocracy brought up to date in a peaceful environment. We entertained a charter from the "Red Hat Group" who had a whole line tour including Duffield and Ravenstor. The picnic area lawn was mowed and the Booking Hall received our charter visitors and a few others that ventured to see what we do including a couple from Canada. Richard was one of our charter team and suffered a failure of his right leg. After being tended to by Dr Thorne and a test positioning in the driver's seat of his car he returned home to return mended, I trust, in the not too distant future. An interesting test project was quoted for and we have our first test customer for some time tomorrow which might indicate that this market is waking up again. next group induction day will be Saturday the 11th of June at 14.00. A generally dull day with torrential rain at times providing us with our first public service operating day of 2011 where it has rained! Having said that, it was by no means quiet as we entertained many happy passengers as well as a large party for train and buffet afterwards. The Class 31 received some routine maintenance after it was shunted back into its position. Meanwhile other routine work continued including the track inspection. hanging baskets to improve the visual delight of that station. Another fairly gentle day for all except the VCT who continue to disentangle cut foliage from our neighbour on the "racing straight". Slow but steady progress is being made and one "generous" fire was reported and my thanks go to the team for persevering with this unwanted nuisance. Alan continued his quest to have the most well presented mileposts in the Country and dealt with 139 1/2 and 139 3/4. All our ground frames, of which there are many, received a scheduled check and necessary adjustments made to Duffield South and the Incline access. Quite a long day given the number of frames involved now. Water supplies featured with 78019 filled up and the two tankers filled ready for the weekend and a new hasp and staple was fitted to the Tool Van so we can attempt to lock the vehicle again. 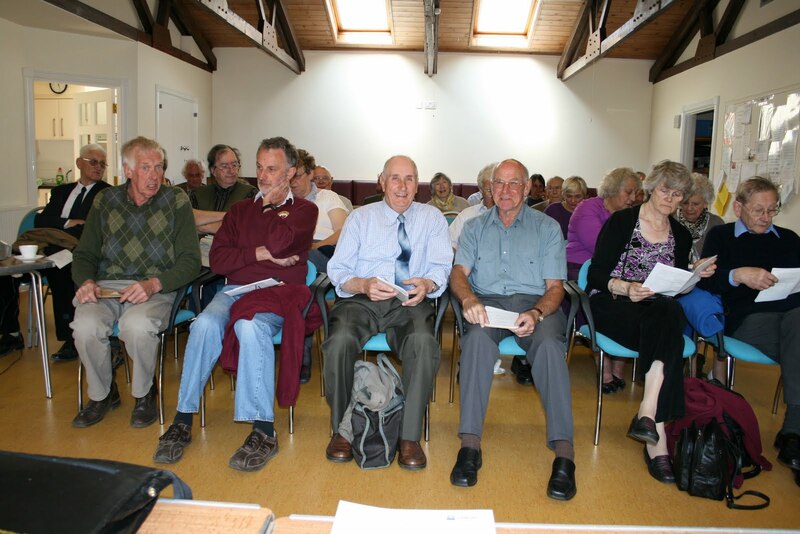 The Booking Hall achieved more group bookings to the benefit of the Railway in the post 78019 situation. PS - A funeral day tomorrow as we say goodbye to Terry Owen who some of you might remember from the pioneering days for his particularly active dog "Alfie". He was one of a cast of people persuaded to participate in the cut and burn stage who had no interest in railways but enjoyed the company and banter of this essential beginning to our Railway. He was in scale to be a jockey but chose a path as a glass blower in his native Stoke. RIP. A gentle day as many volunteers take a well earning rest from Railway activities after the demands of the past few weeks. The lone fishplate bolt fettler was active as he squeezes more life out of these valuable assets and another lone worker refreshed the steam hauled carriage set ensuring our presentation standards are maintained. An opportunity was taken to apply weed treatment to the Incline and if it ever rains again we should see the effect of their labours - not that I am encouraging wetness! The Booking Hall continued endeavours to help recharge the coffers. After the splendid four day holiday we were back in "normal" operation today with the first ever steam "taster" day ably hosted by Mick and Hylton. One of our clients challenged yesterday's furthest travelled visitor having originated in Canberra via Rome where he had worked for the United Nations for the past 18 years. Wirksworth was included in his final European grand tour before retirement back in Australia. Our other client was from Blairgowrie in Scotland and provided further confirmation that the BuyaGift marketing reaches a very large audience. The PWT set off for more fishplate greasing encompassing 10 rail joints or 20 pairs. The VCT tackled the pre-felled vegetation on the "racing straight" and managed to tidy up a further area with one large fire consuming the brash. Alan continued his marathon of milepost refurbishment dealing with 140 and 140 1/4 together with a "work in progress" attempt to repair a gradient post. The DST were fairly smug with their progress today on Henry Ellison having checked the valves, fitted brake and sanding gear together with the clothing on the cylinders. This progress is ascribed to Mary Birch for keeping the team on the straight and narrow. Fred and Iris gave the Mess Hall a deep clean and Dorothy took home a customary load of domestic washing. These unsung heroes really keep us from wallowing in a sea of dirt! A very pleasant call was received from the Air Ambulance service thanking all involved in the medical emergency on board the train and transferred to ambulance at Idridgehay. Happily the passenger who had suffered a minor stroke is recovered enough to return to his native Sweden. I have assured the service of a warm welcome if they wish to visit us at a less stressful time. The Booking Hall caught up with all the accounting work from the weekend and received a rewarding call from the Ecclesbourne School with a generous thank you for a work experience pupil who has been with us for a period of Tuesdays. There is evidence that his time with the Railway has been quite beneficial. An air of calm efficiency marked today as we fielded a full advertised service of steam to Duffield and Ravenstor to the satisfaction of our many passengers. 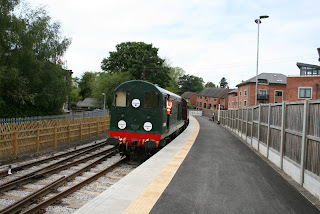 Duffield, again, proved to be the main entry point to the Railway including a stagering number of people arriving by rail into Duffield which will give us much thought for the future. The narrow gauge, evra shop and LMSCA stand all added to the atmosphere of the Railway at Wirksworth. Our furthest traveled visitor was from Saitama in Greater Tokyo who had booked on line and I had noticed we had a forward booking from Japan. She enjoyed her time with us and it is impressive how the through ticketing arrangements are now world wide! My thanks go out, as ever, to all that participated in making today our highest earning day of the four day holiday. It has been exhausting but very worth while in the results produced. To round tonight's comments is a picture from Saturday's WyvernRail Annual General Meeting and you will recognise that a certain department were in pole position. Another excellent day in Wasserville with many baaahking moments. There is no let up on the gorgeous sunshine and associated visitors. Further work was also carried out on the Class 31 and LMS brakevan. Many thanks to all, once again!